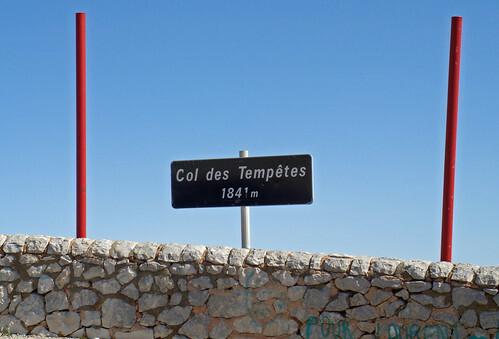 Today I rode the “Routes des Ventoux” cyclosportive. About 150 kilometres and 3000 metres (10,000 feet) of climb. This was fun! I knew climbing Ventoux would be epic but I didn’t expect the rest of the route to be so beautiful (map at bottom). 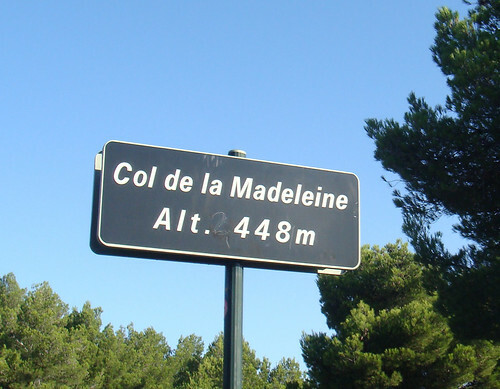 Starting in Villes-sur-Auzon, the first 30 kilometres or so were fast and a little hilly – including the tiny Col de la Madeleine – and then we arrived at base of Mont Ventoux on the Malaucene side. This is a monster. 21 kilometres and 1550 metres ascent (well over 5000 feet). I worked pretty hard and knocked over 10 minutes off the previous time I climbed this side. I guess all these events are paying off. The descent to Sault is about 26 kilometres. It was a little hairy with the wind up high and VERY bumpy lower down. As usual I was pretty cautious and lots of familiar bums passed me. At Sault the route split with the short course heading back, and the long route doing some more climbing. As I turned left, EVERYONE around me headed for the short route – cowards. I was all alone! 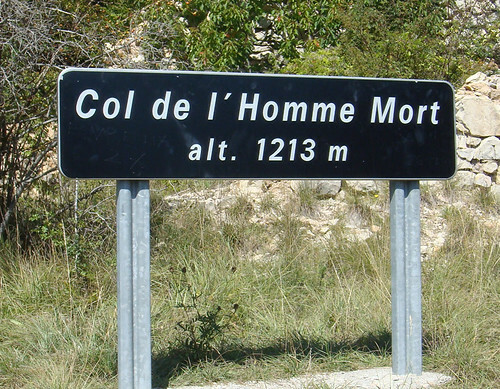 After a while, the climb up to Col de l’Homme Mort (Dead Man”s Pass!) started. It’s a beautiful climb – fortunately not too steep. 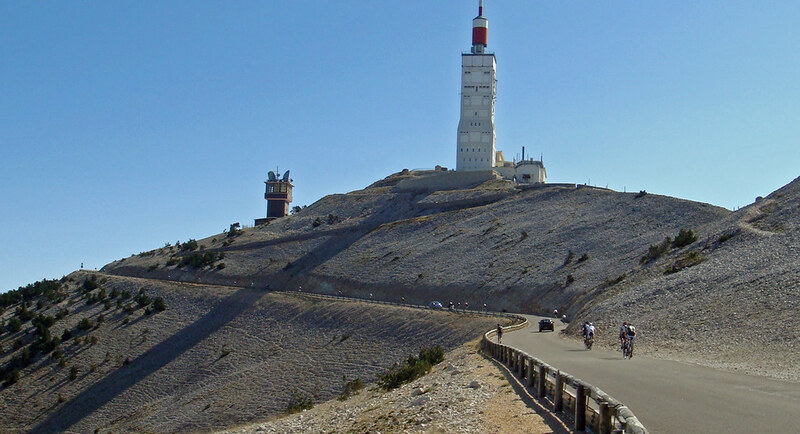 There are great views of the backside of Ventoux throughout. I was getting worried that the water / food station might have packed up – and I needed refilling. Was I in last? But when I arrived (just short of the Col), we spied a bunch of riders behind me and the guy snapped a photo (at right) with a distant Ventoux over my shoulder. And a push to restart as well. Nice! At the Col only 50 (!?) kilometres to go. The next 30 were fast – even I broke 60 kph at one point (that’s like 80 for a normal rider)! Then a final surprise – the last 20 kilometres or so went through the most amazing place. The Gorges de la Nesque. The best way to describe it would be a little “Grand Canyon.” It wasn’t steep – and I was descending – but on a superb cliff road with vertiginous views. Unfortunately I only snapped one quick pic as I was trying to stay with a group – but look at that road! Below: Ventoux looking south from the top. I like getting Col signs! The 4th is smudgy as the guy at the water break gave me some grapes and I dumped them in my camera pocket. Ooops. un grand bravo pour cette nouvelle équipée ! looks like a super event, I’ve only done Ventoux from the Bedoin side. I need to get back there again. If you have a decent list of european cyclosportifs if would be great if you could blog the list. I keep finding out about events the week after they take place..
Si le Ventoux est le passage obligé, la région offre beaucoup d’autres cols intéressants. 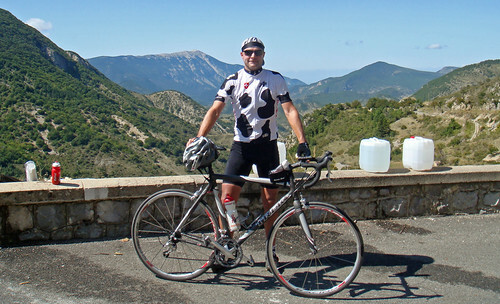 Nice jersey, and ve-ery impressive legs! All I can say is : You are SOOO lucky! And “Well done” of course! “Lucky you” to live in cyclist’s paradise and congrats for another cyclosportif! Although I’ve already spent 10months in Geneva-Region (with only 3 more weeks to go :-(), I never made it to the Ventoux. 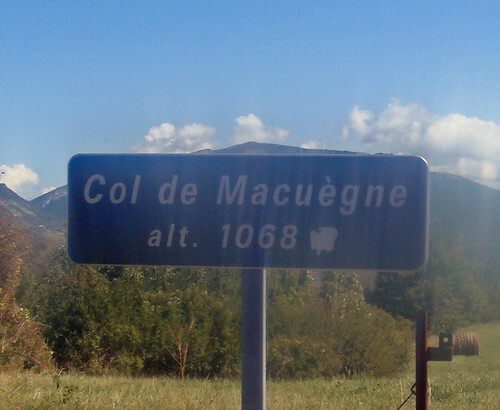 Which is obviously no surprise, with all these cols and climbs right in front of one’s nose. But postponed ist not abandoned…! If you don’t mind I will add three more cyclosportifs of which I think they are both: a severe challenge to any cyclist and nice, well-organized events with participants from all over europe. Thanks very much for the suggestions. I am a cyclosportive newcomer and I am really hoping to finally visit the dolomites next year. And the Oztaler looks fantastic. And yes, you are correct. Cycling paradise here. WOW… what a landscape… a beautiful ride indeed! I guess the calf is feeling better. Glad to see you tearing it up. Fantastic ride and great photos! 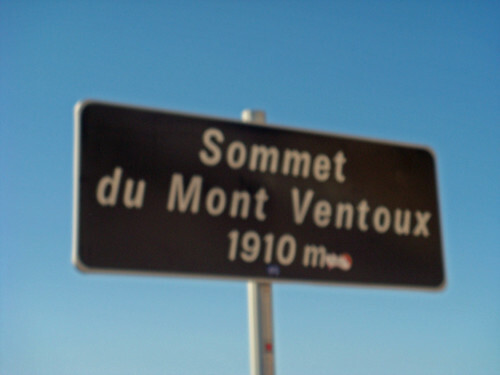 Ahh, the usual beautiful views of Ventoux – but it’s always so windy up there! Well done though, that’s an impressive loop you did there.